We observe Veterans Day to reflect on the sacrifice and bravery of the men and women who serve in our armed forces. Originally, Veterans Day was known as Armistice Day, and it was a celebration of the end of World War I on the eleventh hour of the eleventh day of the eleventh month in 1918. The United States also chose Armistice Day as a chance to honor those who served and lost their lives during that war. After World War II, Armistice Day became Veterans Day in the U.S., and today we honor all veterans who have served our nation. Today, there are many men and women in the armed forces. Chances are, every student in your classroom knows of someone serving or who has served—be it a grandparent, parent, aunt or uncle, or family friend. Will you be talking about Veterans Day this week? How do you help your students understand veterans’ service and sacrifice? One way to do this is to show your students photographs of active-duty servicemen and women, as well as veterans. Use the National Geographic Education collection of resources on the military to find photos that fit your discussion best. Here are a few that may inspire your students to learn more about the veterans in their lives, and their experiences. You can ask your students: Looking at these images, what might it be like to be a soldier during wartime? What conditions do they face? How do those conditions change in different conflicts? How do soldiers adjust to life in different climates, seasons, landscapes, cultures? Soldiers of United States 64th Regiment, 7th Infantry Division, celebrate the news of the armistice that ended World War I on November 11, 1918. The 64th regiment, organized at Fort Baker, Texas, served in the Lorraine region of France. While servicemen and women are on tour or in training, their families are often left missing them at home. These images illustrate that military families are often a strong forces themselves. Groups like the United Service Organizations (USO) and others also work with families of members in the armed forces to help them through time apart. How do your students react to family photos like these? How do they think time away from a loved one may impact the everyday and long-term family relationships? Amanda, Lisa, Carolina, and Kyle Meuth relax at the USO Center at O’Hare International Airport during a six-hour layover from San Antonio, Texas, on their way to Munich, Germany. “My husband is on mid-tour leave. We are meeting him in Munich and will travel to Paris and Rome. It’s our first time visiting a USO Center,” Lisa says. The USO (United Service Organizations) is a nonprofit organization whose mission is to lift the spirits of military service members and their families. Click the photo to read more about the USO. Army Capt. Peter T. Hofman reads a book to his children, though they are thousands of kilometers apart. Capt. Hofman recorded the video from the USO Center in Kandahar, Afghanistan, where he is stationed. United Through Reading is one of many programs the USO provides to troops and military families. Click the photo to read more about the USO. The men and women serving our nation are often put in harm’s way. They fight in battles that can cause devastating injuries, and loss of life. This image depicts a soldier who lost two legs, but still wears his uniform with pride. How do students feel looking at this photo? What do they think about the soldier’s attitude? What obstacles do students think disabled veterans encounter? How do they think communities can help improve everyday life for veterans and other disabled people? Col. Gregory D. Gadson is an active service member in the U.S. Army. 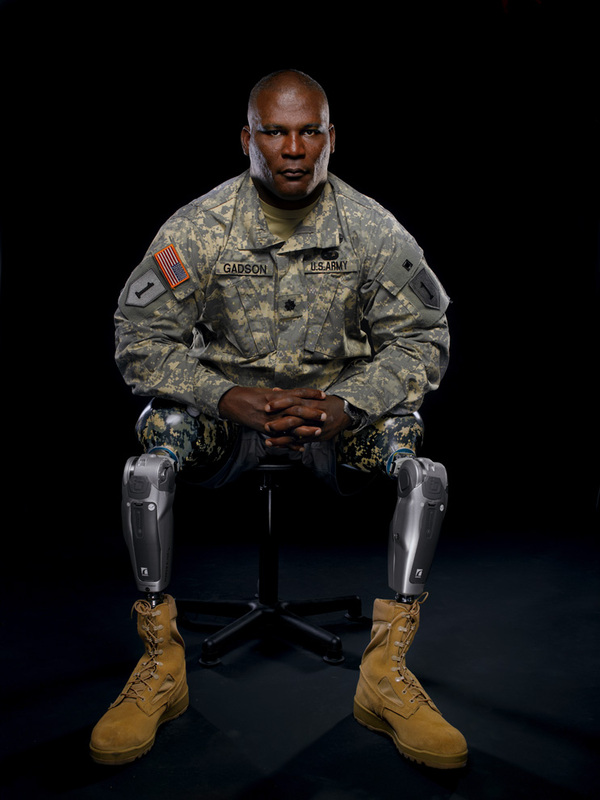 Col. Gadson (a lieutenant colonel when this photo was taken) lost both legs and severely injured his arm after his vehicle encountered a roadside bomb in Baghdad, Iraw. Col. Gadson was returning from a memorial service for two fallen soldiers when the attack occurred. These images are available in the many resources available in the National Geographic Education military collection. We invite you to observe Veterans Day in your classroom by sharing these photos and photos in your personal collection to get your students talking about the men and women who serve our nation. Next Next post: Did The Language You Speak Evolve Because Of The Heat?